I'm a running a class on Oct 29, teaching 7 fun ways to use Shimmer Paint. The Shimmer Paint Resist technique is one of the techniques you will learn at this class. If you're interested in attending, click this link to send me an email. Send Karina an email! I will also show this fun technique at my facebook live this Tuesday at 1:00 MST. TIP: One tip I want to share is the color of my card. 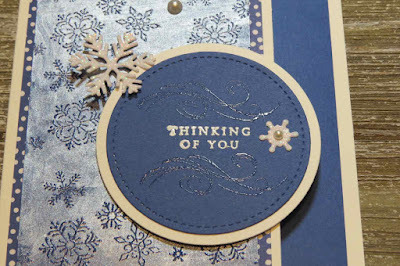 I used the In-Color Blueberry Bushel and the coordinating Designer Series Paper. When you buy the in-colors, I highly recommend purchasing the matching designer series paper. It's easy to create beautiful cards when you colors match. Here's the supplies to make this fun card at home.